"Music is food for the soul" but how well is music coming from young ones without knowledge in music feed the soul.Sunyani as for sometime now produced great talents but the question here is can music be based on just vocal talent or there is more to it . If that is the case then be involve and attend media 360 connect's one day musical workshop slated for 25th June ,2016 on the 3rd floor of the SSNIT building, Sunyani. 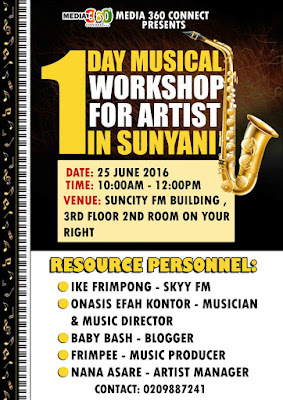 The Workshop which will started at 10am and close at 12pm will have a renowned music director , a sound engineer, a celebrity and entertainment blogger, an artist manager and a radio personality to educate and imbibe the basic essentials of music and need for all musicians to join MUSIGA as an upcoming artist. The event which is one of its kind promises to make an impact in young and upcoming talents , and will see to the progress of such talents in Sunyani. 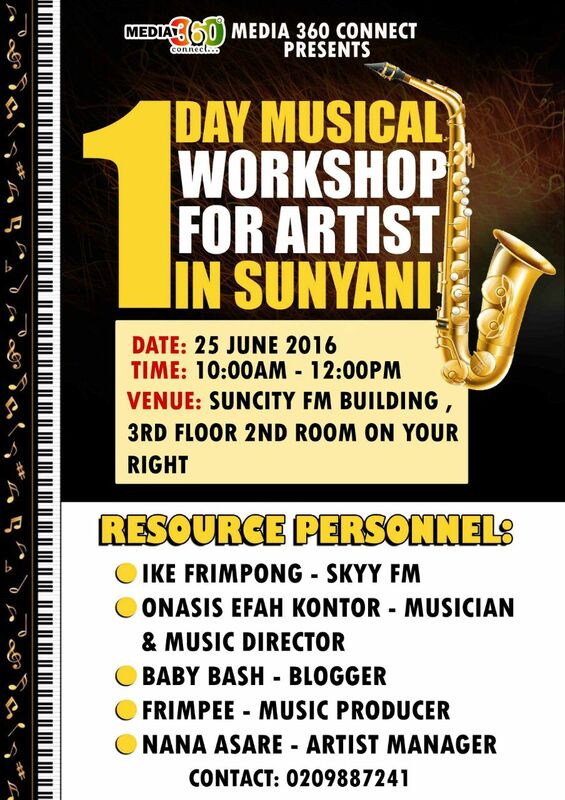 The coordinator of the workshop Nana kwaku Asare appealed and asked all music interested persons to attend the one day event, he also stated clearly that ,the workshop is free for all.